QD�s cute chatty Christmas critters! 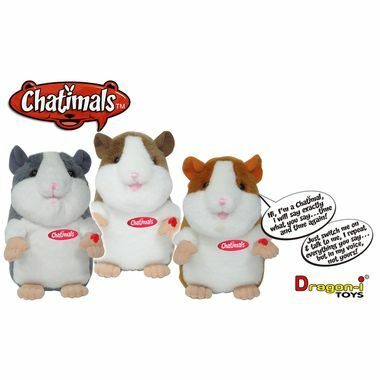 Chatimals - the furry natterers which repeat whatever they hear - are amongst this year's must-have gifts for kids of all ages at value retail chain, QD Stores this Christmas. Just squeeze Max, Sophie and Oscar's paw, say whatever you want them to say, and they'll repeat it back to you in hilarious high or low pitched voices. And they speak any language! The chatty critters are amongst a range of talking toys fromNorwich-based QD Stores Group. The independent value retail chain, together with subsidiaries Lathams of Potter Heigham and Cherry Lane Garden Centres, is rolling out a wide range of great gifts this Christmas in its High Street and out-of-town locations across East of England and Home Counties as well as Doncaster and Wrexham. They're all ready and waiting for Santa, along with gifts ranging from Polaroid tablets, Onesies snuggle suits, an enormous range of top food and drinks brands, plus Christmas decorations, wraps and crackers - all at cracking low cost! QD kicks off its Christmas TV advertising campaign with a special promotion to tie in with the much-anticipated and newly released second album from "X Factor" boy band finalists, One Direction. 'Take Me Home' promises to be another spectacular success for the chart-busting band who star in a special Christmas campaign for bags, bedspreads, comfy cushions, towels and pyjamas, all featuring fab pictures of the boys. One Direction showcase new album "Take Me Home" when they headline New York City's Madison Square Garden on December 3rd 2012. The Simon Cowell-signed band embarks on a world tour in February. Go in-store for more, or shop online at www.qdstores.co.uk - QD Top 250 products get guaranteed next-day delivery anywhere in the UK.